... more books! Steds is awash in text books of all sorts. How? The Millican Initiative. This initiative, made by Paddy Millican, was to collect any and all sorts of text books at the close of the last semester all in an attempt to save residents from price gouging of the ND Bookstore. 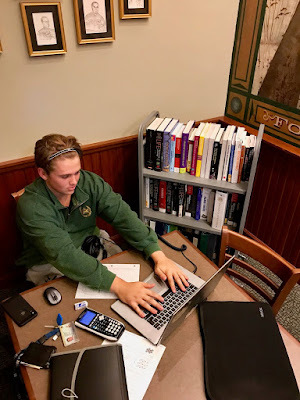 So, at the close of the Spring Semester, text books were dropped off at the Staff Office, catalogued, and then carted and taken to the Gregorian Study Lounge, where any and all residents could access them. The Edwards' Administration has reiterated its commitment to continue the Millican Initiative and help Stedsmen save a buck or two... probably more! On having free text books, Joe Herlihy, Steds sophomore, said, "My dad always use to sleep on his textbook the night before a test, I figured it couldn't hurt."